Alone Against the North: An Expedition Into the Unknown (Viking Canada/Penguin Canada, 2015) by Adam Shoalts announced as the winning entry of the 2016 Young Authors Award. The Honourable Dave Levac, Speaker of the Legislative Assembly of Ontario, presented the award during a ceremony at the Ontario Legislature on March 6th, 2017. A classic adventure story that is gripping and often poetic, Alone Against the North recounts Shoalts’ expeditions into previously uncharted and undocumented areas of the Hudson Bay Lowlands in northern Ontario, proving that the age of exploration is not yet over. Alone Against the North is available for sale at the Legislative Gift Shop and featured in the Legislative Library. 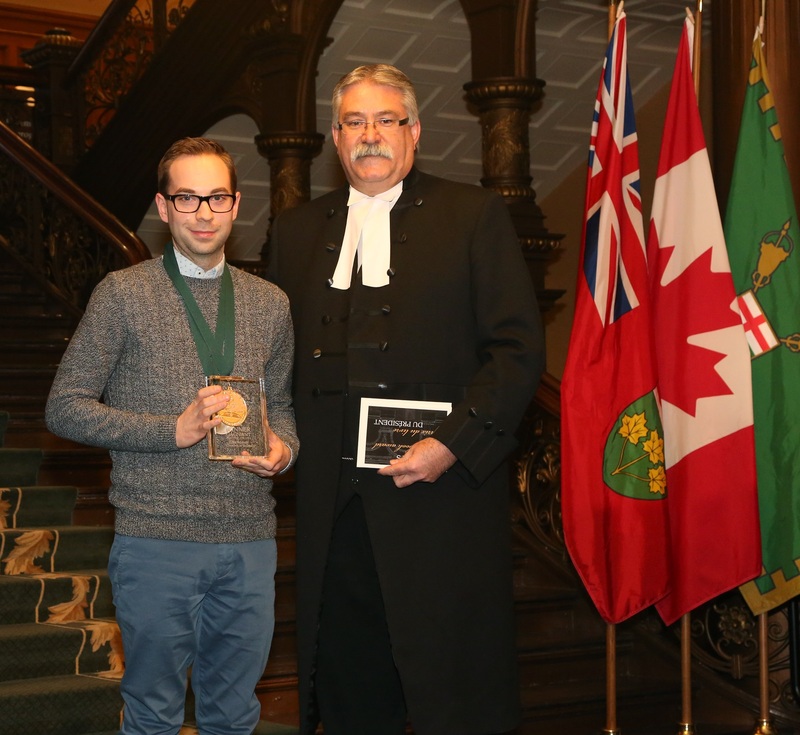 The Honourable Dave Levac announced Giles Benaway as the inaugural winner of the Young Authours Award for his collection of poetry entitled Ceremonies for the Dead (Kegedonce Press, 2013) during the Speaker's Book Award ceremony on March 9th, 2015. Of Odawa/Potawatomi, Cherokee, Métis and European descent, Giles' poetry examines the haunting themes of inter-generational trauma, cyclical abuse and inherited grief. Black humour and satire fill the collection, illuminating a fierce determination to survive and resist colonization and the endurance of culture and identity under extreme duress. Ceremonies for the Dead is available for sale at the Legislative Gift Shop and featured in the Legislative Library.